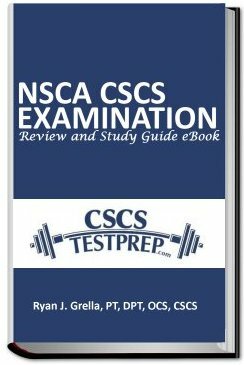 The NSCA CSCS Examination Review and Study Guide eBook is designed to help strength coaches, athletic trainers, physical therapists, chiropractors, physicians, personal trainers, researchers, educators, and various other professionals prepare for the National Strength and Conditioning Association’s Certified Strength and Conditioning Specialist examination. It is intended to be used as a supplement to the CSCS examination preparatory text Essentials of Strength Training and Conditioning 4th Ed, and contains a review of all 24 chapters and 550 multiple choice practice questions. 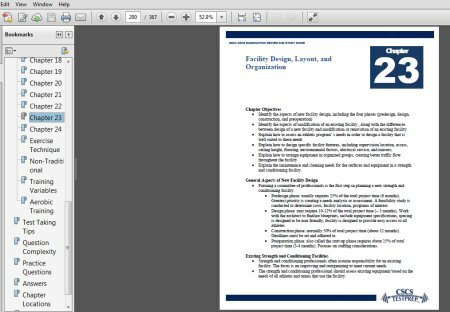 This eBook creates value by maximizing the utility and efficiency of your CSCS exam preparation strategy, and allows for quick review, application, and memorization. 45% of Candidates FAIL the CSCS Exam, Are You Prepared? Sidebar Navigation Menu with Expandable Links – Makes it Very Easy to Go Directly to a Specific Section on a Desktop without Scrolling Through the Entire Guide. Two 75 Question Practice Tests – that Mimic the Scope and Question Distribution of an Actual Exam. 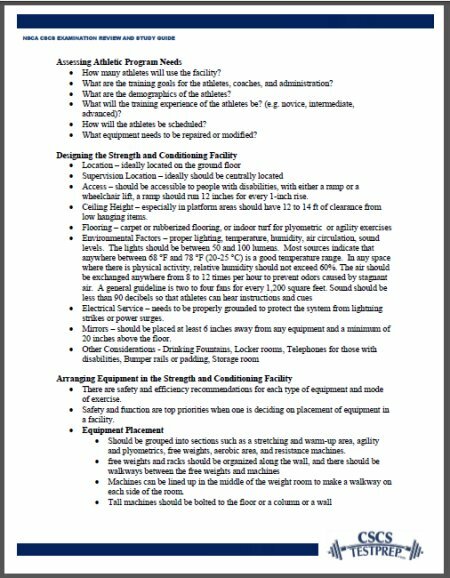 Bulleted Summaries of all 24 Chapters of Essentials of Strength Training and Conditioning 4th Ed. – Increase the Efficiency of Your Review and Quickly Identify Sections that Need to be Re-Read. Tips for Answering Multiple Choice Questions – Increase Your Odds of Choosing Correctly, a Skill that Improves with Practice. 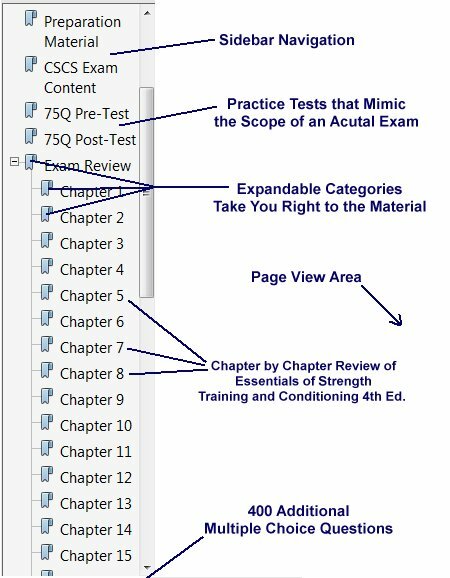 550 Total Practice Questions and Answers – In Order to Test Your Comprehension of the Material and Identify Sections that Need Further Review. 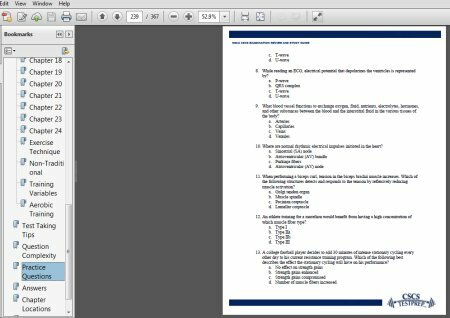 90-Day NSCA CSCS Examination Preparation Plan: The NSCA CSCS Examination Review and Study Guide eBook and Essentials of Strength Training and Conditioning represent an investment in your exam success. However, without a comprehensive plan to guide your preparation you will be unable to get the highest value from these resources. The 90-Day NSCA CSCS Examination Preparation Plan is a blueprint for exam success. Presented in easy to read table format (Like a course syllabus) each day has a specific assignment to complete. Successful CSCS exam candidates don’t just study harder, they study smarter! Human Skeletal Muscles: Do you know the attachments and actions of all the muscles of the human body? How about the Supraspinatus? What about their innervation and blood supply? As you prepare for the examination and as a practicing strength training and conditioning specialist it is vital to have an understanding of muscular anatomy and function. Presented in table format this document allows for quick review, and contains the attachments, innervations, blood supply, and actions of the human skeletal muscles. 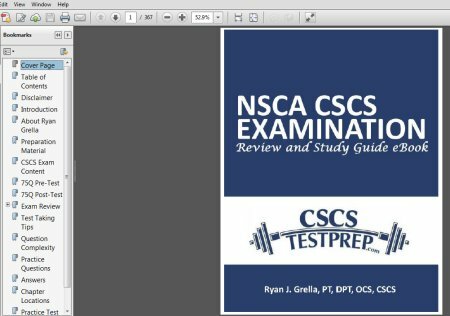 What is the cost for the NSCA CSCS Examination Review and Study Guide eBook? 45% of candidates fail the CSCS examination, and it is well established that failing the CSCS examination will lead to significant repeat costs for candidates. The NSCA sells 204 online practice questions for $162 to members and for $215 to non-members. With 550 practice questions this resource could easily command $50 before the chapter by chapter summary of Essentials of Strength Training and Conditioning is even included. For that information, the NSCA in partnership with Human Kinetics sells the NSCA CSCS online study/CE course for $199.00. So, even at $50 this resource is inexpensive compared to the study guides available today. However right now, the total investment for the NSCA CSCS Examination Review and Study Guide is only $29.99 $27.99. Instant Download, No Waiting for the Guide to Arrive! Instant Download, Invest in Your Exam Success!